Sometimes, when you encounter complex issues with Manuscript or Kiln, such as troubles with an expected UI behavior, we need some information from your browser’s perspective in order to help you resolve it. This article explains how to generate a HAR file, which contains a record of a browsing session. The directions vary by browser. This will present a developer section at the bottom of your browser window. Select the Network tab. Now navigate through your browser’s web pages until you are ready to record your session. If the record button isn’t active (usually red) then click it. Now click clear to remove any extraneous history. Now you are recording your session, browse away until you have captured what you wish to share with us. When you are done click the record button to stop recording – it should go grey. 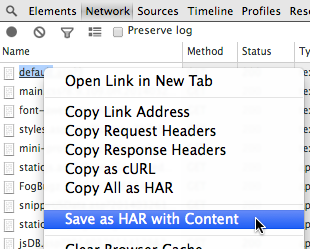 To save your browsing activity, right-click inside the developer panel and select Save as HAR with content. Once you have saved the HAR file you can send it to us as a case attachment. Now navigate through your browser’s web pages until you are ready to record your session. Now click the garbage can icon to remove any extraneous history. Browse away until you have captured what you wish to share with us. To save your browsing activity, right-click inside the developer panel and select Save All As HAR. Press F12 or use the Gear Menu> F12 developer tools. Now navigate through your browser’s web pages until you are ready to record your session. If you aren’t currently recording, then click the green play button to enable network traffic capturing. When you are done, click the red square to stop capturing. To save your browsing activity, click the save icon and choose to save as XML. Once you have saved the XML file you can send it to us as a case attachment.